That hectic holiday time is back in full force and that means most folks are spending more time shopping for presents, setting up light displays and other decorations and attending lots of celebrations with family, friends, and co-workers. Which means less time for making meals. Fortunately, Maggiano’s Little Italy at Tampa’s Westshore Plaza can handle all of your lunch, dinner and weekend brunch needs whether you are dining in, taking out or enjoying an event that is catered by this popular Italian restaurant. The large, lovely restaurant located in Tampa’s Westshore area can even help out in the gift-giving department with handy gift cards for those folks who have everything, including good taste in food! This is also a great spot for a quick pick-me-up while making your way around a crowded mall and trying to find everything on your shopping list. Time it just right to enjoy a nice bite and beverage for a nice price. Happy Hour specials are available Monday through Friday from 3 - 6 p.m. Enjoy your choice of select beers, wines, cocktails and flatbreads that are all priced from $3 - $6. It doesn’t get any happier than that! Weekend brunch is another great option for leaving the dining duties to others. It is served from 10:30 a.m. - 3 p.m. Saturdays and Sundays. Some super tasty items served on weekends include Chef’s Featured Pancakes, which vary monthly, Lemon Ricotta Pancakes or egg dishes are made with sausage, veggies or a combo of ham, bacon, and sausage. Or try the tempting Creme Brûlée French Toast or Maggiano’s Crispy Chicken and Waffles for big bites of bliss. There's even a bevy of Benedicts that will make your mouth water whether you choose from The Meatball, Smoked Salmon & Spinach, Nueske's Smoked Ham or Crab Cake selections. Pair your pick of brunch dishes with delicious brunch cocktails. Choose from, not one but two, versions of a Bloody Mary, one mixed with Beam Eight Star Whiskey and the other sporting Svedka Vodka, each for a very appealing price of only $5. Or order these cocktails by the glass or by the pitcher: Sparkling Sangria, Aperol Spritzers, Ruby Red Peach Coolers and, the always popular, Mimosas. Cheers to that! Maggiano's has also provided guests at its Tampa location with a sommelier selection of wines for simply sipping, sharing or pairing with any meal that can all be enjoyed as six- or nine-ounce pours as well as by the bottle. "This is a very limited list featuring the personal favorites or our sommelier that is exclusive to our restaurant," said Deborah Benanti, managing partner of the Tampa Maggiano's. Each wine is accompanied by details that highlight its specific flavors and what makes it stand out. Have lots of visitors headed your way for the holidays or need a lively space for a group gathering? 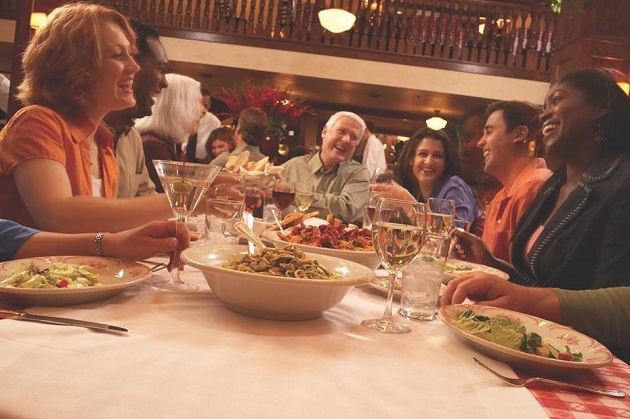 Maggiano’s offers private dining spaces plus is open Thanksgiving, Christmas and New Year’s Eve in Tampa. For more information, call Maggiano's Little Italy at 813.288.9000 or visit their site. Stay connected with things to do in Tampa by registering with us at 813area. It's free and easy!